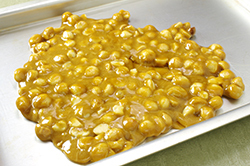 Use shelled, unsalted macadamia nuts or peanuts for this old-fashioned candy recipe. 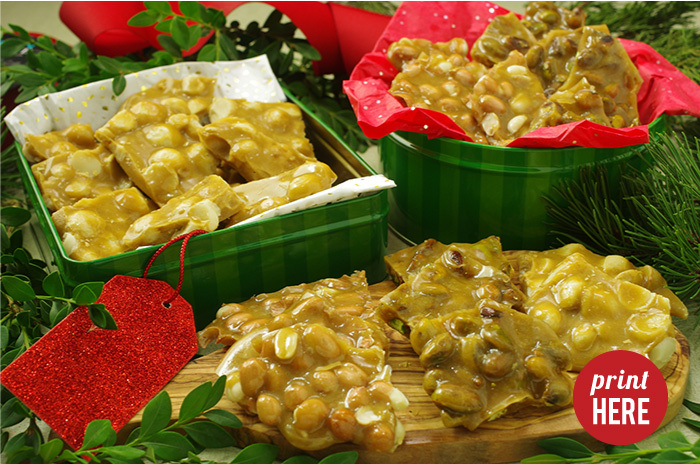 Break the cooled brittle into chunky pieces and package into bags or boxes lined with waxed paper. Although delicious eaten just as is, brittle would be delicious broken into small pieces and scattered over ice cream or a fudgy, frosted chocolate cake. 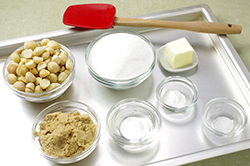 1.Grease a solid baking sheet with sunflower oil. 2. 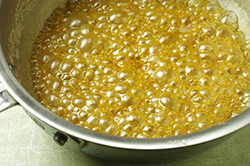 Pour both sugars and the corn syrup into a medium-sized heavy saucepan. 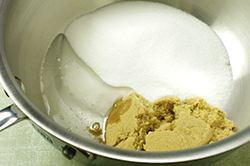 Add 1/3 cup water and stir over medium heat until the sugar has completely dissolved. Add the butter and stir until melted. 3. 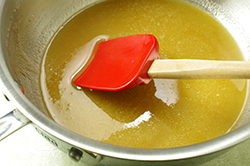 Bring the mixture to a boil and continue to cook steadily until the temperature reaches 310° F (154°C) on a candy thermometer. 4. 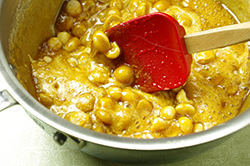 Remove from the heat and immediately add the baking soda, salt, and nuts, stirring well as the mixture foams up. Pour on to the baking sheet and spread level with the back of a wooden spoon. 5. Once the brittle is completely cold and hardened, break it into pieces and package in cellophane bags. It will keep for 3 - 4 days in an airtight box.